موسویان, سیده نفیسه. (1390). معماری منظر در پرتغال؛ «خوائو نونش» نماینده نسل اول معماران منظر. مجله علمی-ترویجی منظر, 3(15), 16-17. سیده نفیسه موسویان. "معماری منظر در پرتغال؛ «خوائو نونش» نماینده نسل اول معماران منظر". 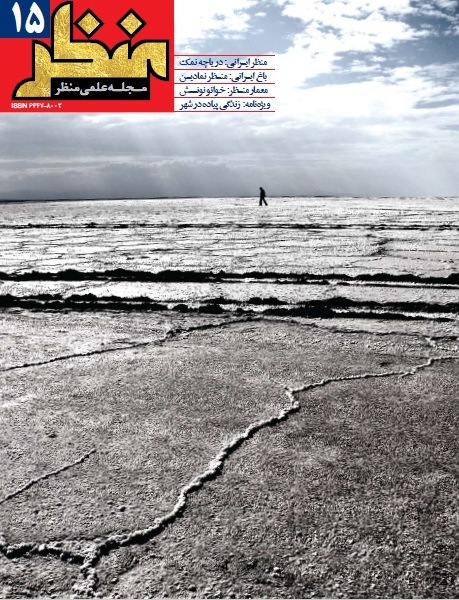 مجله علمی-ترویجی منظر, 3, 15, 1390, 16-17. موسویان, سیده نفیسه. (1390). 'معماری منظر در پرتغال؛ «خوائو نونش» نماینده نسل اول معماران منظر', مجله علمی-ترویجی منظر, 3(15), pp. 16-17. موسویان, سیده نفیسه. معماری منظر در پرتغال؛ «خوائو نونش» نماینده نسل اول معماران منظر. مجله علمی-ترویجی منظر, 1390; 3(15): 16-17. Known as a small country in West Europe, Portugal is not famous for its avant-garde and old landscape architecture doctrine (unlike France and Germany), but has found its way and has moved forward in a special landscape architecture language throughout the late decades. As a result, there are numerous architecture companies all over this country which are influencing the world with their unique design. The leading role of the first landscape architecture generation has made its achievement possible in this part of Europe in an influential way. Among all João Nunes and PROAP companies have been the most diligent groups nationally and internationally. João Nunes was born in 1960 in Portugal; he received his landscape architecture degree by the Higher Institute of Agronomy at the Technical University of Lisbon in, afterwards he got a master´s degree in Landscape Architecture at the School of Architecture in 1996. Eventually he completed his studies in Poly technique university of Catalonia. Having founded the PROAP Company alongside other famous companies such as Global, Arpas and Topiaris with 50 years of brilliant reputation, João Nunes is considered among the first landscape architect generation. This generation has introduced new definitions for the landscape architecture carrier in Portugal based on professor Caldra courses, the disciplines of German architecture doctrine and the most importantly the opportunities which were provided by the joining of Portugal to the economic community of Europe. Besides his effort to incorporate the functions to the normal metabolism process, considering architectural aspects, as a movement against the “sheer naturalism” are the most common characteristic seen in his projects. There are three evident points in his projects: firstly; time and landscape. He always tries to show that a landscape project must approach as an organization tool of a series of times, steps and states. The architectural and investigation work directs its efforts toward the interpretation of the place, the recognition of its rules and its working mechanisms and where to base the construction of its approaches and proposals according to which a landscape project must approach as an organization tool of a series of times, steps and states. In this sense, it works integrating a complex group of processes without proposing a rigid and predetermined way of development. It possibly manipulates the metabolic factors of the nature and includes an ideological and artistic meaning. It combines these factors with human factors, economic results or mere wishes and expectations. He emphasizes on the differences between the work of an architect and a landscape architect, which is time. Landscape is more a piece of time than a piece of space. In this sense, it works integrating a complex group of processes without proposing a rigid and predetermined way of development. It possibly manipulates the metabolic factors of the nature and includes an ideological and artistic meaning. It combines these factors with human factors, economic results or mere wishes and expectations. Emphasizing on landscape as a series of symbols that have formed throughout time is the next point. The third point is to emphasize on the differences between the identity of elements and natural materials and the manufactured materials. Putting these contrasts together shows the differences more evidently. The Portuguese architects and companies have experienced worldwide projects because of Portugal entry to Europe union and its consequences. João Nunes and his group has several successful international projects, among them, Tejo and Trancão Park (Lisbon, Portugal), Porto, the cultural capital of Europe(historic renewal) and new light stadium of euro 2004 football matches.